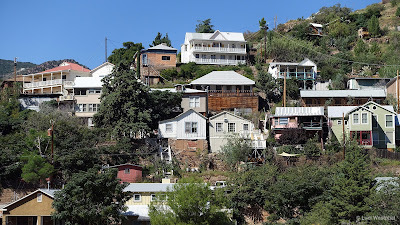 Bisbee is a former mining town in Cochise County in Southern Arizona - very close to the Mexican border. It's claimed to have the best year-round climate on Earth. Only 92 miles southeast of Tucson, Bisbee is a popular mountain getaway from the desert heat. Bisbee was established in 1880 as a copper, gold and silver mining town - and named after one of the Copper Queen Mine's investors: Judge DeWitt Bisbee. 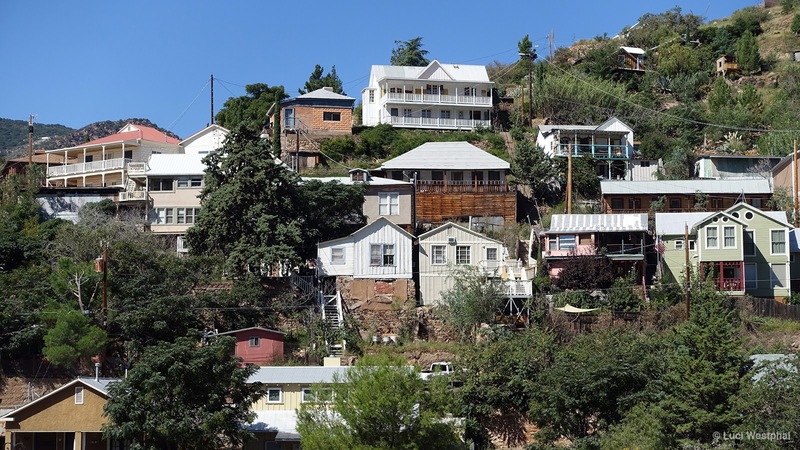 Today, Bisbee has a population of about 5,500 and is known for its early 20th architecture and its alternative and creative spirit. I very much appreciate the slogan on the Discover Bisbee website: Come be yourself, be inspired, be refreshed... Come be Bisbee for awhile. When talking about this town, I should also mention the Bisbee 1000 - The Great Stair Climb. It's the only outdoor stair climb event in the USA. The 4.5-mile course features nine staircases (over 1000 total steps) connected by winding roads. We drove some of those skinny winding roads - but I decided to leave out that footage because it was soooo slow. The 26th Annual Great Stair Climb takes place on October 15, 2016. This video was shot almost exactly one year ago, when Jess Grotfeldt and I went on a spontaneous road trip from Tucson to the Arizona wine country and beyond. We felt drawn to Bisbee because of its unique hotels that keep the Wild West spirit alive and especially the funky Bisbee Grand Hotel, which has a grand collection of theme rooms and suites. However, when we first got to town and we only had minutes to decide, we booked a room in a different hotel (not in the video). Later that evening, we went to the Bisbee Grand Saloon for a drink... and the awesome bartender (wish I could remember her name), let us check out the hotel and our coveted Oriental Suite. As soon as I saw the Chinese bed, my mind was made up: I HAD to sleep in that bed!!! So, um, yeah, we booked that suite, got our belongings from the other hotel and paid for two different rooms in two different hotels for one night. Crazy? Sure. Worth it? Totally! The next day, I got to see and photograph most of the rooms and suites that weren't occupied. I would love to return and stay in the Cowboy Suite... sleeping in a covered-wagon-bed? Yeah!!! We also eventually met the two very personable owners, Bill and Valerie Thomas, who set up the hotel in the early 1990s. I think what I like about the hotel so much is that it's not your fancy Disney-esque theme hotel, but something put together and managed by regular, creative, passionate folks. That's what gives it so much character. My enthusiasm may explain why this short video features almost more images from the hotel than the town itself. The song in this video is “Mountain Sun” by Jason Shaw of Audionautix. He made this song available via the CC BY 3.0 license, which is awesome! Thank you, Jason!